Cultural Alliance of York County hasn't added a story. The Cultural Alliance will host a friendly singing competition between York-area singers/bands to inspire York pride, celebrate the arts and their impact on our community, highlight local talent, and most importantly, raise awareness for our 2016 Annual Campaign. Cultural Alliance of York County hasn't posted any updates yet. Cultural Alliance of York County is managing the funds for this campaign. 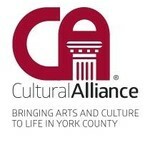 Cultural Alliance of York County is a verified organization.